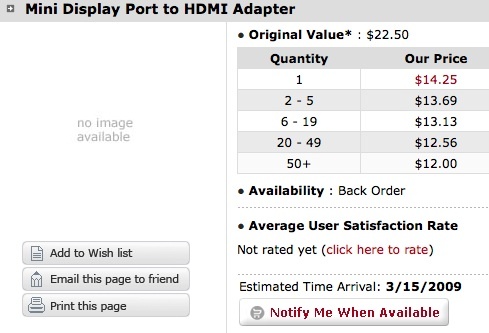 MonoPrice has finally published an estimated arrival date for its Mini Display Port to HDMI adapter. The date for the cable is March 15, 2009 and will give all of you recent MacBook, MacBook Pro, and MacBook Air owners the ability to connect your brand new notebook to anything that can take the (clearly) more universally excepted display connection. HDMI Cable, Home Theater Accessories, HDMI Products, Cables, Adapters, Video/Audio Switch, Networking, USB, Firewire, Printer Toner, and more!.